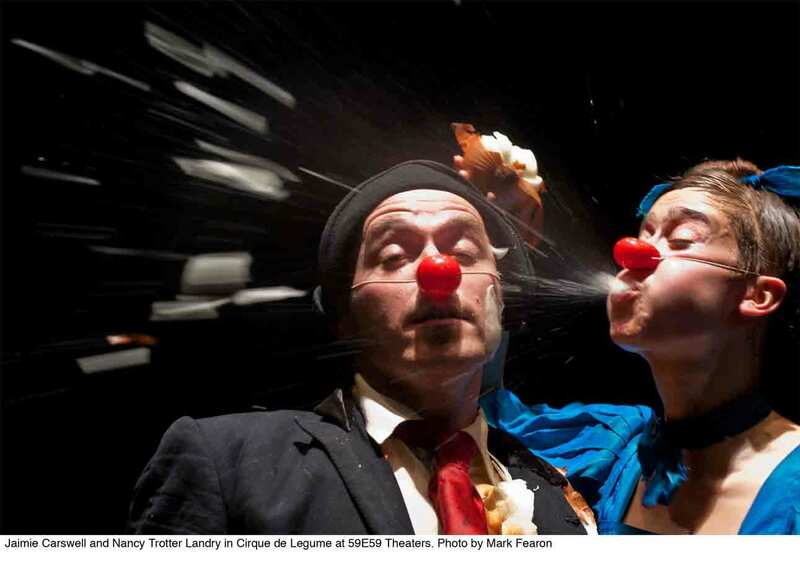 is a bit of a circus, at least to the extent that there is plenty of clowning around from the two clever stars, Jaimie Carswell and Nancy Trotter Landry, with cheerful direction from Pablo Ibarluzea. The show runs just under an hour with no intermission and would, I believe, be absolutely marvelous for children, though sadly none were present at the evening performance I attended. I can just imagine the charming impact children’s joyful laughter would add to the event. That did not prevent the adults in the audience from having a very unusual and jolly good time. music typical of the Big Top. In fact an eclectic program of varied merry music from cha-cha, to mambo, to jazz and beyond would add to the fun of the numerous comic routines performed. As one may have guessed from the show’s title, vegetables share the stage with our stars, and before the show is over I can tell you there will be vegetables all over that stage. How that happens is central to the fun. Then came the mysterious and exotic unveiling of a brown velvet case containing “sharp knives.” Well, not really. The “knives” were actually hot red peppers and there is plenty of fun to follow with them being used in knife-throwing displays. Then there is cucumber fun that features cartwheels and handstands; but one of my favorite segments was the hypnotizing of Landry as Carswell swings a dangling small vegetable in front of her. Under hypnosis she suddenly (and very convincingly) becomes a bird, a goat and a mouse. Her impression of a waddling seal is another winner, and the two combine their antics for a kind of innocently seductive striptease show in the peeling of an onion. Now for some this may be too much of a good thing in the confines of a theater. I imagine if Ed Sullivan were alive he would have enthusiastically given the routines about ten minutes on his television program. 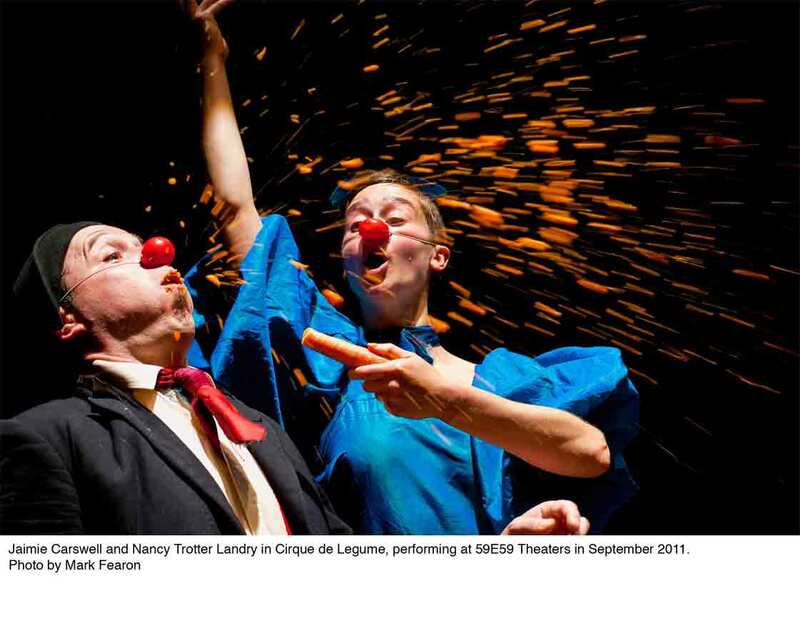 Already a hit at last year’s Edinburgh Fringe Festival, I think The Independent of London very well described CIRQUE DE LÉGUME when it used the words, “Creative Lunacy!” Why not stop by and see for yourself? Oh, and by all means bring the kids along! CIRQUE DE LÉGUME continues through October 2nd. The performance schedule is Tuesday, Wednesday, Thursday & Sunday at 7:30 PM; Friday – Saturday at 8:30 PM; and matinees Saturday at 2:30 & Sunday at 3:30 PM. Performances are at 59E59 Theaters, 59 East 59th Street, between Park and Madison Avenues. Tickets are $25 ($17.50 for 59E59 Members) with Sunday evening performances for $15.00. To purchase tickets, call Ticket Central at (212) 279-4200 or visit http://www.59e59.org. This entry was posted in Broadway, Miscellaneous Reviews, Theater Reviews and tagged Broadway, comedy, Entertainment, musicals, New York, Reviews, theatre. Bookmark the permalink.